Health care costs in the United States are by far the highest in the world and controlling them is a perennial challenge of public policy. Any effort to balance the costs and fundamental goals of a program as complex and sizable as Medicaid poses challenges for both states and the federal government. However, controlling overall Medicaid costs and capping federal Medicaid spending are fundamentally different approaches. Recent proposals to curtail the federal government’s funding commitment to health care and long-term services and supports for the nation’s poorest and most vulnerable populations would shift a substantial share of the program’s cost burden onto states. Yet, the capacity of states to bear additional responsibility for Medicaid is limited. There are strategies for controlling costs in the health care system, such as addressing the social determinants of health, that would not fundamentally alter the structure of the program and would maintain Medicaid’s great strength to grow in response to a range of often unpredictable factors. This brief discusses Medicaid’s role in the nation’s health care system, as well as its budgetary footprint and financing structure. 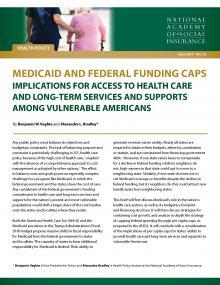 It discusses strategies for containing cost growth and analyzes in depth the policy of capping federal spending through per capita caps, as well as its implications for states’ ability to provide health care and long-term services and supports to vulnerable Americans. Production of this brief was funded by AARP. It was produced in conjunction with the project Strengthening Medicaid as a Critical Lever in Building a Culture of Health, funded by the Robert Wood Johnson Foundation.